Submitted by mahoney on Mon, 03/22/2010 - 7:46am. 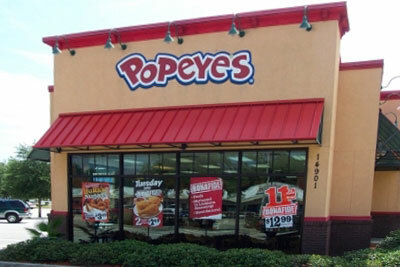 This is a listing of the Popeyes Chicken restaurants in the USA and Canada. The listing was compiled directly from the Popeyes website locator. GPS visualizer was used to obtain the coordinates. If you find locations that I missed, please send them to me. Submitted a new location in Lake St Louis,MO. Added 20 new locations to the file. Completed the update of the remaining states. Net increase of 351 locations. Updated CO (7), CT (2), DC (3) and DE (2). Increase if 14 locations. Updated CA. Added 41 new locations. Added 13 new locations. WA (6), WI (4) and WY (3). Updated the Canadian locations. Added 54 new locations and corrected 2 addresses. Updated the file. Net increase of 72 locations. Updated the file. Net increase of 45 locations. Updated the file. Net increase of 190 locations. Submitted a new location in Layton,UT. Added 18 new locations. AZ-3, FL-4, GA-3, ID-1, NV-1 and ON-6. Submitted new locations in Herriman,UT and Ogden,UT. Updated the file. Net Increase of 133 locations. Updated the file. Net increase of 41 locations. Added 9 new locations: CT (2), MA (2), NH (1), OH (1) and VA (3). Added a location at 2016 E Joppa Rd, Baltimore,MD 21234. Added a location in Syracuse,NY. Corrected the coordinates for the location at 7050 Jimmy Carter Blvd, Norcross,GA 30092. Updated the file. Net increase of 52 locations. Updated the remaining states. Net increase of 105 locations. Submitted corrected coordinates for the location Hill AFB, UT. Updated the Tx portion of the file. Net increase of 49 locations.